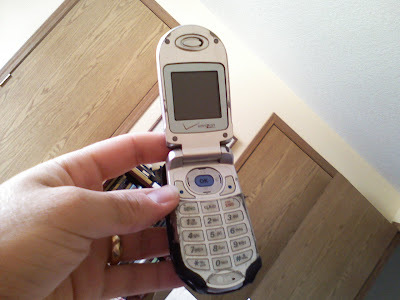 This is a picture of my old cell phone. I got it four years ago and it still works fine. I dropped it in a toilet during Year Two. I ran over it with my bicycle during Year Four, and then hit the brakes just as my tire came across it, so the bike skid across the pavement with the phone grinding beneath it. It has traveled through many a country, been throttled by children, crushed in glove boxes and buried alive in ancient pyramids while treasure hunting. I had to trade it in because Washington has a new law forbidding me from driving while talking on my cell phone. So my wonderful and generous mother went and bought me an Auditory Cybernetic Enhancement. When I tried to "pair" it with my phone the earpiece said, "This old piece of junk is a phone? I don't think so." Therefore, I had to search all the brummagem and "free phones" provided by my carrier until I found one I could stomach. I took this picture of my old phone with my new phone. My new phone has a camera. It can also send text messages, film movies, surf the internet, play music, give directions with its GPS, shoot grappling hooks, send out ultrasonic squeals that cause criminals to wince and drop their weapons, sonar capabilities, respond to voice commands and beat Bobby Fisher at chess. I think it's Batman's old phone. Of course I can't afford to activate anything on it, and I can't figure out how to make a phone call with it. I've been hanging up on people, dropping calls, missing texts, losing messages. It's spectacular. And I'm keeping it for at least four years. now you can do video blogs straight from your phone, how awesome would that be? Hey! "Brummagem" was dictionary.com's word of the day on Sunday! Do you subscribe to those daily emails, too? Yup. As of Saturday. Thought I'd increase my vocab a bit. This was a new one on me so I thought I'd try it out. You'll be waiting a long time for Bobby's next move unless your phone has a VERY extented calling area. ew...I was talking to you on a toilet phone?